6 Guitars is a pitch perfect blend of music, comedy, and characters. 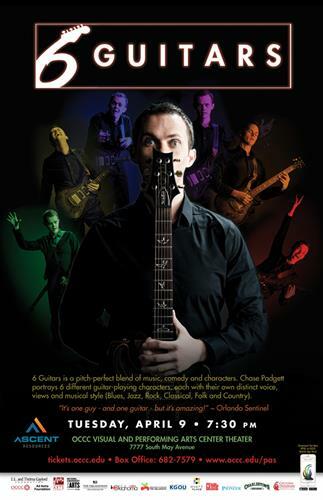 Chase Padgett delivers a virtuosic performance as he becomes six different guitar players each with their own distinct voice, views, and musical style (Blues, Jazz, Rock, Classical, Folk, and Country). During this 85-minute show, each of the characters ranging from a 19-year-old rock prodigy to an 87-year-old blues man share their journey with music from discovery to mastery through songs and stories that leaves every audience laughing, crying, and falling in love with music all over again. 6 Guitars premiered in the 2010 Orlando International Fringe Festival where it was greeted with sold-out houses and standing ovations. Since then he has traveled internationally, becoming one of the most successful shows from the Canadian Fringe Festival Circuit by breaking attendance records and receiving high praise from critics. In 2013 it became one of the top five highest grossing shows in the history of the Winnipeg Fringe Festival by selling nearly 3,000 tickets in twelve days. In the spring of 2014, 6 Guitars was one of the top showcases at Pacific Contact, a juried showcase for arts presenters in British Columbia and beyond.